The Compliance and Enforcement Strategy defines how the North Western Inshore Fisheries and Conservation Authority will enforce local, national and international law. It allows those regulated to have a clear expectation of the enforcement responsibilities of the NWIFCA and its officers. Guidance on Fixed Administrative Penalties can be found here. At the end of each section, a .pdf version of the text is available to download. Alternatively, you can download the full Compliance and Enforcement Strategy with Appendices here. On the 1st April 2011, the North Western Inshore Fisheries and Conservation Authority (“the NWIFCA”) was established under the Marine and Coastal Access Act 2009. 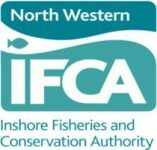 The NWIFCA took over responsibility for the management of fisheries and conservation of marine resources within its district from The North Western Sea Fisheries Committee and the Cumbrian Sea Fisheries Committee. The district extends from the Solway Estuary in the North, to the Dee on the Welsh border in the South, and out to the six mile limit at sea. A map is available on the NWIFCA website at http://www.nw-ifca.gov.uk/. This document sets out how the NWIFCA will deliver its duty to enforce fisheries and conservation regulations in its District. It addresses a High Level Objective for the NWIFCA set by Defra. Successful fisheries management requires an integrated approach encompassing broad communication and consultation, scientific research and effective enforcement. A principle aim of the NWIFCA is to ensure the sustainable exploitation of the fisheries resources within the district and to balance the social and economic and needs of the region with the needs of the local marine environment. A vital aspect of this aim is the promotion of full compliance with EU, UK and in particular local fisheries and environmental legislation. The NWIFCA is well placed to achieve this aim as it is a small and specialist organisation, comprising membership which represents the divergent interests of the local community, and experienced officers who work in partnership with a variety of other expert organisations. A primary factor in encouraging compliance is access by those being regulated to the proper information which sets out the requirements of the law. This includes the regulations themselves and explanatory guidance and background information which can help users of the marine environment to understand their obligations. The NWIFCA believes that better understanding and knowledge of the law is key to promoting compliance. Further details of the information provided and of the commitment of the NW IFCA to advice and guidance can be found in the NW IFCA Advice and Guidance Policy Statement at Appendix 1. A second key element in achieving high compliance is engaging all professional and recreational users of the marine environment, as well as interested governmental and charitable organisations, in the local management process. By becoming involved in a co-operative management process the NWICFA and all other participants can get a far better understanding of the other interested parties. The NWIFCA seek to reach a consensus between the competing interests in fisheries resources through an on-going process of consultation and adaptation of local regulation and enforcement approaches. Conflicts of interest will not always be resolved but having gained an understanding of why actions are taken, affected individuals and groups will be far more likely to accept the final approach adopted. The NWIFCA will also continue to review its decisions and approaches to regulation and enforcement in order to ensure they are as effective as they can be and to respond to the developing needs of the local fisheries and marine environment. This aims to ensure that no user or single interest feels ignored or is frustrated by bureaucratic inertia and so all will be motivated towards compliance with regulation. A list of the organisations the NW IFCA will seek to work with in managing the sustainable exploitation of the sea fisheries resources in their district can be found in List of Key Partner Organisations at Appendix 2. This list is not a substitute for the Public Consultations which the NWIFCA conducts which are open to all members of the public. Through its sensitivity to the needs and experiences of marine users, in consultation with its partner organisations and respecting the evidence provided by scientific data, the NW IFCA aims to comply with the principle of minimum regulation. The NWIFCA seeks to create a management and regulatory regime which imposes the minimum burden possible on those regulated, while also living up to its obligations of sustainable management with respect to the needs of all marine users and the marine environment. In its approach to enforcement the NWIFCA begins from a position that the vast majority of the community of people, organisations and industries using the marine environment and exploiting fisheries resources are compliant with the regulation and control that affects them. However, the NWIFCA recognises that there is still a significant risk of non-compliance where there is the potential for financial gain, such as in economic activity related to fisheries. In order to secure a goal of complete compliance enforcement of regulations must provide an effective deterrent which will minimise the potential gains from non-compliance and maximise the advantages for those who follow the law. Enforcement of the regulations must therefore be consistent, accountable and proportionate, to create confidence in the legal regime. Further details of the NWIFCA enforcement approach can be found in the NWIFCA Sanction Policy Statement at Appendix 3 which sets out the powers and sanctions the Officers will use and the principles which will use to guide their actions. The foundation of full compliance is easy access to reliable information to help those regulated to adhere to the obligations imposed by the law, be it local, national, or international. A closely related requirement is to provide access to the scientific evidence behind the approach of the law to help those regulated understand the reasoning behind the obligations imposed. The NWIFCA will therefore seek to inform and educate stakeholders, providing advice and guidance to regulated users of the marine environment on the rules it will enforce. The NWIFCA provides a range of guidance and information. Much of this, for example byelaws (with notes), and minimum-landing sizes can be found on the NWIFCA website at http://www.nwifca.gov.uk. Further information, including some scientific data and other guidance and policy documents is available on request from: NWIFCA, 1 Preston Street, Carnforth, Lancashire, LA5 9BY. The NWIFCA recognises the importance of such advice, guidance and information being suited to those who will need to use it. Good guidance requires a detailed understanding of the target audience and so consultation is essential to producing good guidance. Therefore, the NWIFCA aims to incorporate its guidance in its broader consultations on enforcement and regulatory approach. The NWIFCA therefore has as a goal that its guidance should be structured around the first hand expertise of those it concerns and their ways of working. The membership of the NWIFCA is selected to represent a wide range of the views of the local users and managers of the marine environment and so is already sensitive to many of the practices and experiences of the target audience. In addition, NWIFCA officers continually assess their regulatory and enforcement approach with reference to the conversations and interactions they have on a day to day basis with marine users. The NWIFCA aims to ensure that its guidance is in simple, clear language and avoids the use of jargon where possible. Where an issue is necessarily technical the NWIFCA will not gloss over the difficult aspects but will seek to provide proper explanation of the relevant information. It is also intended that such guidance will recognise its limitations where any subject is too technical or difficult, such that it should not mislead users. The NWIFCA will also try and ensure that the guidance it keeps on regulation will be up to date. Details of upcoming changes will be provided in advance wherever possible. The NWIFCA will continue to gather and interpret scientific data, in partnership with other relevant organisations, to promote the development of well-founded and pragmatic legislation. Where possible guidance and information will include the date it was written and if relevant, the date it is due for review. A strength of the NWIFCA is the experience and dedication of its enforcement and scientific officers who aim to serve as a link between the local users of the marine environment and the regulatory and conservation organisations. The NWIFCA will continue to develop the skills and experience of these officers with the goal that they serve as an invaluable source of knowledge and guidance to regulated users in all sectors. The officers of the NWIFCA will continue to be proactive in helping those regulated to understand and comply with the law. The NW IFCA will seek to conduct its business in a way which is transparent, reasonable and fair, such that any interested party can gain a clear understanding of the rationale behind any decision taken. The quarterly meetings of the NW IFCA are open to the public and where possible, the documents for such meetings are made available on the website in advance. If you would like further information about IFCA in general and their regulatory role and background please see the website of the Department for the Environment, Food and Rural Affairs at: http://www.defra.gov.uk/environment/marine/wwo/ifca/. The following is a list of the organisations and individuals the NW IFCA may contact or consult as part of its process to develop management solutions for the marine environment. The list is indicative and may not be exhaustive or closed. Other bodies will be added as they become known and the NW IFCA welcomes any contact by organisations or individuals with information or advice seeking to assist the NW IFCA in its management role. 1. The NWIFCA works in accordance with the Hampton Principles of Better Regulation as set out in the Regulators' Compliance Code and the Legislative and Regulatory Reform Act 2006 (as amended). The NWIFCA will also adhere to the principles as set out in the Investigators' Convention (2009) and the Prosecutors' Convention (2009). 2. As a manager of fisheries resources the NWIFCA aims to make sure those regulated take appropriate action to comply with relevant legislation and NWIFCA byelaws. The purpose of prosecution is to punish and deter offenders, as well as to reassure those who are complying by ensuring that any benefits from non-compliance are removed. 4. As the NWIFCA believes that prevention is better than enforcement we offer a range of guidance and advice to those regulated to enable them to comply as easily and efficiently as possible. The NWIFCA will work with other government regulators such as the Environment Agency, Natural England, Marine Management Organisation and the Department for Environment, Food and Rural Affairs, as well as voluntary groups and NGOs in order to achieve our goals of managing inshore fisheries. 10. all its activities and, in particular those that would place a "burden" on a regulated person (such as monitoring, inspection, investigation and compliance actions), are targeted to a specific identifiable need (therefore, for example, limiting random inspections to specific identified compliance requirements). 12. Inspection: Officers of the NWIFCA will routinely inspect fishing equipment and fishing vessels to ensure compliance with the obligations imposed by the law. When doing so the Officers should at all times behave in a manner in accordance with the Code of Good Conduct for IFCA Officers Conducting Inspections at Appendix 4. 13. Oral Advice or Verbal Warning: This will take the form of simply informing the regulated person what needs to be done or changed to be compliant. 14. Advisory Letter: Where it is believed that breaches of the law may have been committed, an advisory letter may be sent reminding the regulated person(s) of the need to obey the law. This may be sent without prejudice to other sanctions. 15. Official Written Warning: Where there is evidence that an offence has been committed, an official written warning letter may be sent to the regulated person(s), outlining the alleged offending, when it occurred and what regulation(s) were breached. It will also set out that it is a matter which could be subject to prosecution should the same behaviour occur in the future. This may be sent without prejudice to other sanctions. 17. The appeal mechanism for the notices is set out in the Marine Licensing (Notices Appeals) Regulations 2011. 18. Financial Administrative Penalties. The NWIFCA may issue a financial administrative penalty (“FAP”), the level of which may be up to £10,000 (see The Sea Fishing (Penalty Notices) (England) Order 2011)1 as an alternative to criminal prosecution in certain circumstances. A FAP may only be issued where there is evidence of offences committed, and may be issued to the owner, skipper and/or charterer of an English or Welsh vessel wherever it operates, or of a foreign fishing vessel operating within the English and Welsh part of British Fishery Limits. Payment of the penalty will discharge the possibility of the NWIFCA prosecuting the offence. However if a FAP is not paid within the required timescale (28 days), the matter will proceed to court (note that non-payment of the FAP is not an offence). Further information on FAPs is available in the document NWIFCA Financial Administrative Penalties for Fisheries Offences available on the website or from the NWIFCA office. 19. Seizure and Disposal: The NWIFCA may seize and dispose of offending goods and fish – certain provisions provide for seizure and disposal of goods and fish e.g. of illegal fishing net attachments or undersized fish. In addition the NWIFCA may order fish which have been caught illegally or which are undersized to be returned to the water. 20. Prosecution: Where appropriate and following application of the tests in the Code for Crown Prosecutors, the NWIFCA may institute prosecution proceedings. Further information about prosecutions is set out below. When instituting criminal proceedings, the NWIFCA will select the most appropriate charges, which may include those under general criminal law. 21. Proceeds of Crime Proceedings: Where appropriate, in exceptional circumstances, following conviction of persons for significant acquisitive crime, the NWIFCA may consider instigating proceedings under the Proceeds of Crime Act 2002 to deprive offenders of the unlawful benefit of their criminal activity. i. The power to enter and search business premises and, in exceptional circumstances, dwellings. ii. The power to require production of and to inspect documentation. iv. The power to board and inspect fishing vessels. v. The power of forfeiture in respect of fish and fishing gear suspected to be unlawful. vi. The power to detain vessels or marine installations. vii. The power to monitor licensed activities or development to ensure compliance with licence conditions. 23. This is not an exhaustive list of powers available, but it shows some of the more commonly-used powers. The NWIFCA will exercise its powers carefully and exercise due restraint to ensure use is proportionate to the particular circumstances. 24. The majority of the NWIFCA's powers derive from the Marine and Coastal Access Act 2009 and the Sea Fisheries (Conservation) Act 1967. Investigations will be carried out by NWIFCA Officers in accordance with the Criminal Procedure and Investigations Act 1996 and the Codes of Conduct issued under the Police and Criminal Evidence Act 1984. 25. Information and evidence gained by a Marine Officer may be used in furtherance of one of the Enforcement Options set out above. In some circumstances, information or evidence obtained by our officers in the exercise of their duties may be shared with other Government bodies or agencies. 26. Criminal prosecutions are an infrequently used but important tool in discouraging noncompliance; the purpose is to secure conviction and ensure that the wrongdoing can be punished by a Court at an appropriate level, thus acting as a deterrent to any future wrongdoing to both the offender and others who may engage in similar criminal behaviour. 27. It will be used where the offending is considered to be particularly serious, is repetitive, may cause significant harm to the environment, has resulted in significant unlawful profit, has caused a disruption of the market concerned – and therefore disadvantage to other legitimate operators – or where it is otherwise necessary in all the circumstances relating to the alleged offending and the offender. 28. A prosecution may be commenced where it is felt that the matter is too serious or not suitable for another form of disposal such as a fixed administrative penalty, warning or caution. 29. In order to prosecute, the prosecutor has to be satisfied both that there is sufficient evidence of the alleged offending and that there is a clear public interest in taking criminal proceedings. 30. As a public prosecutor the NWIFCA acts under the supervision of the Attorney General and abides by the principles set out in the Code for Crown Prosecutors (http://cps.gov.uk/publications/docs/code2010english.pdf, published February 2010), the two main principles of which are set out below. 31. As a public prosecutor, the NWIFCA will only commence a prosecution if it is satisfied that there is a "realistic prospect of conviction" against each suspect on each charge on the available evidence. If a case does not pass this test, it will not go ahead regardless of how important or serious it may be. 32. If a case passes the sufficiency of evidence test, the NWIFCA will consider whether it is appropriate to prosecute, or whether it is appropriate to exercise one of the enforcement options available to it as set out above. In determining the correct response in any individual case, the NWIFCA will always take into account the public interest in prosecuting. 33. Where there is sufficient evidence to justify a prosecution, or offer any form of out-of-court disposal, the NWIFCA must go on to consider whether a prosecution is required in the public interest. Assessing the public interest is not simply a matter of adding up the number of factors on each side and seeing which side has the greater number. Each case must be considered on its own facts and on its own merits. 34. In addition to the public interest factors set out in the Code for Crown Prosecutors, some common public interest factors which should be considered when deciding on the most appropriate course of action to take are listed below. The following lists of public interest factors are not exhaustive and each case must be considered on its own facts and on its own merits. i. The implications of the offending on the enforcement of the regulatory regime, e.g. a failure to comply with conditions of a fishing licence undermines the integrity of the licensing scheme and may adversely affect legitimate operators. ii. The impact of the offending on the environment including wildlife and having regard to, for example, Marine Conservation Zones and other protected areas. iii. With regard to offences affecting fish and fish stocks, whether recovery species are involved, and any issues as to quota status. iv. Any implications the offending had or may have had on public health. v. The degree of harm the offending may cause to any aspect of the marine environment or any protected species. vi. The financial benefit of the offending or other financial aspects of the offence including the impact on other legitimate operators. vii. Whether the offence was committed deliberately or officials were obstructed during the course of the offending / investigation. viii. The previous enforcement record of the offender. ix. The attitude of the offender including any action that has been taken to rectify or prevent recurrence of the matter(s). x. Where offences are prevalent or difficult to detect, the deterrent effect on others by making an example of the offender. 35. This is not an exhaustive list and in any given circumstance the NWIFCA may take into account such aggravating or mitigating features as are relevant in each individual case. 36. Criminal proceedings may be commenced against all those persons suspected of the offence(s). Where there is sufficient evidence and it is in the public interest, proportionate and appropriate to do so, the NWIFCA may commence proceedings against companies or other bodies liable for offending and company directors or other statutory office holders, where we believe there is evidence of personal liability. This Code of Conduct should be read in conjunction with other statutory and policy requirements. Inshore Fisheries and Conservation Officers (IFCOs) are employed and warranted by Inshore Fisheries and Conservation Authorities to carry out inspections of marine organisms, fishing vessels, fishing equipment and vehicles. Their duties also include monitoring compliance and enforcement of EU, UK, local fisheries and environmental legislation both ashore and out to 6nm from the coastline. Some IFCOs also enforce on behalf of other government bodies such as the Environment Agency and the Marine Management Organisation. Whilst carrying out inspections, IFCOs will endeavour to conduct inspections in a courteous and fair manner and will promote a professional image on behalf of the IFCA. IFCOs will state their intentions and may ask for assistance in order to carry out their duties. Those subject to inspection are expected to show a level of cooperation and courtesy that will allow the IFCOs to carry out their duties without fear of reprisal, harassment or abuse and to avoid any action which would amount to obstruction of the IFCO. Persons subject to inspection must alert the IFCO carrying out the inspection to any potential hazards and it is expected that IFCOs and Masters of vessels being inspected will maintain good communication in order to ensure Health and Safety is not compromised. On the conclusion of an inspection, the IFCO will inform those inspected of the findings. This may result in words of advice being given or a caution being issued where the person inspected is suspected of not complying with the relevant legislation. If it is necessary to seize equipment during an inspection, the IFCO will issue a receipt. The lead enforcement officer will introduce him/herself to the skipper of the vessel subject of the inspection. The Officer will explain why they are on board and what it is they wish to inspect. The presence of the skipper can be requested for all or some of the elements of an inspection process. Assistance of the skipper and/or crew must be provided if it is requested. All IFCO’s carry warrant/ID cards which will be made available for inspection upon request or when it is practicable to do so In order to facilitate an inspection, it is expected that Masters of vessels maintain a proper VHF watch on Channel 16 and cooperate and respond when hailed. In the interests of Health & Safety, Masters will be asked to facilitate a safe boarding for IFCOs carrying out inspections and to cooperate and comply with specific instructions to aid a safe boarding and compliance with legislation. Examples of such requests may be to slow down, to offer a lee or haul gear and provide a suitable boarding ladder. Each individual inspection will dictate the nature of the request made. It is the intention of the IFCA’s to conduct inspections so far as possible with minimal interference. The IFCA will endeavour to carry out necessary further investigations leading from inspections in a timely manner. IFCOs will not always be in uniform when carrying out their duties. However, all IFCOs will present their Warrant Card when identifying themselves. Any questions about this document, the carrying out of inspections or subsequent investigations or anyone experiencing dissatisfaction during any of these processes can send their concerns in writing to the Chief Officer of the relevant IFCA. The time for responding may depend on the nature of the concerns highlighted but where possible such concerns will be addressed in a timely manner.